Ever since we reviewed Universal Audio's first–generation plug–in DSP PCI card, the UAD1, back in the October 2001 edition of SOS, more and more musicians have invested in the platform. This must partly be on account of the company's many painstaking digital recreations of classic analogue processors (including some of their own hardware range), which have been very successful in translating Universal Audio's enviable reputation for sonic excellence into the computer–studio world. But you can never have enough plug–in power, of course, so even since 2004 Universal Audio have been beavering away to give the concept a shot in the arm. 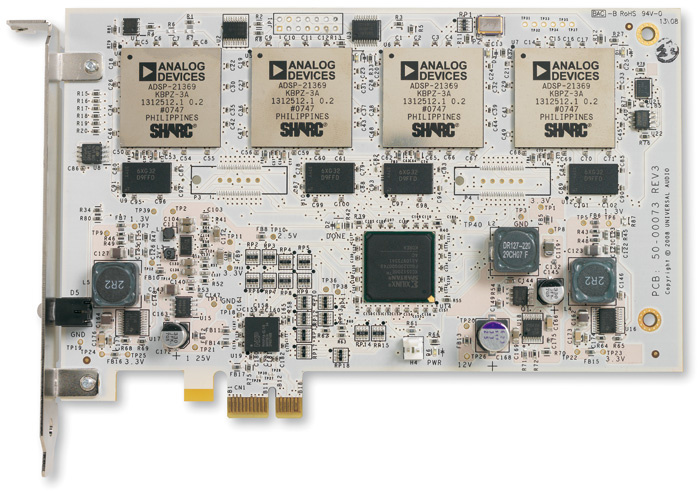 However, unable to source a more powerful code–compatible replacement for Chromatic's Mpact 2 Media Processor chip (on which the UAD1 was based) they had to go back to the drawing board and design their new UAD2 around another signal processor, a step which inevitably lengthened the development process such that the second–generation hardware has only now begun shipping. Where multiple cards or DSP chips are installed, the new UAD v5.0 control software dynamically assigns your plug–ins between the available SHARC chips for maximum efficiency, in a way that is invisible in use — all you do is select the plug–ins within your sequencer exactly as if they were running natively. Another handy function is 'Load Lock'. A number of the UAD plug–ins can have sections disabled to conserve processing power, but if you use too many of these, you can find yourself in a position where enabling previously unused plug–in features pushes you over your hardware DSP usage limit. If you find this annoying (as I do), enabling Load Lock forces the cards to ring–fence the maximum DSP power that your active plug–ins might need, irrespective of whether you're currently using them to their full potential, so you don't find yourself running out of power just as you're putting the finishing touches to your mix. Naturally, this will normally give you fewer plug–ins, as each plug–in always hogs its maximum DSP quota. All three cards are short PCI Express types, with the Solo being a half–height card and the others full–height. They will run with both Mac OS 10.4/10.5 and 32– or 64–bit Windows XP/Vista machines, and have been designed specifically to cater for multi–thread and multi–processor CPU setups. Supported audio sample rates include 44.1kHz and 48kHz, as well as multiples of these up to 192kHz, although plug–in counts reduce proportionally at the higher rates, as you'd expect. Hardware and software installation on my machine was as easy as pie, and authorising the plug–ins was also pretty simple, even though my studio machine isn't connected to the Internet. All you have to do is get the UAD2's control software to generate you a web link file, which you can then open on any Internet–capable machine. You then download a single authorisation file (no matter how many plug–ins you have authorised), transfer that back to the studio machine and drag it onto the control software's desktop icon. UAD1 plug–ins need to be re–authorised for the UAD2 platform, and this will normally set you back $25 per plug–in, up to a maximum of $250. However, this only needs doing once, no matter how many UAD cards you add to your system, and until the end of 2008 Universal Audio will transfer any UAD1 plug–in authorisations to UAD2 free of charge. In addition, if you purchase a UAD2 within that time–frame, you'll also get an additional plug–in voucher: $100 for the UAD2 Solo, $150 for the Duo, and $250 for the Quad. 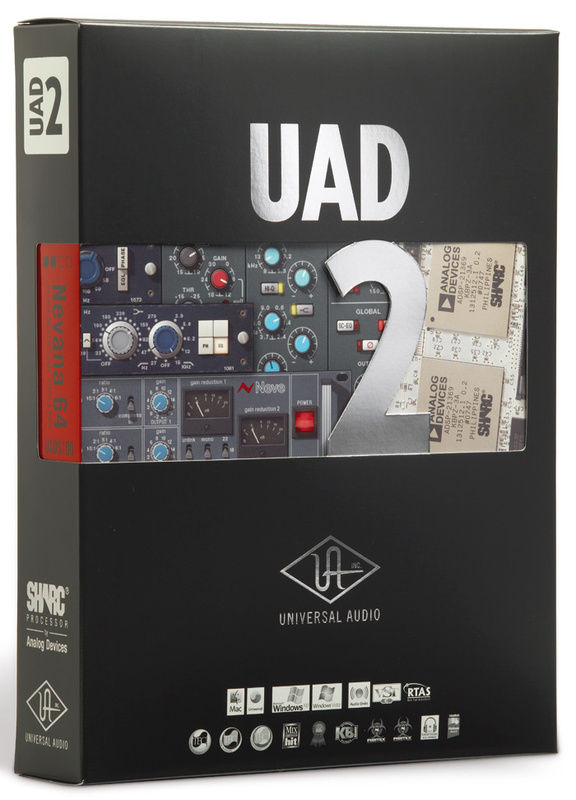 This is what all the fuss is about — the UAD2 Quad card with its four Analog Devices SHARC 21369 DSP chips.In the Version 5.0 control software the plug–ins are provided in VST and AU formats. Pro Tools users will have to wait for their RTAS format, as this isn't yet officially supported, although Universal Audio imply that you may be able to use a limited number of UAD2 plug–ins in Pro Tools if you keep your audio hardware driver's buffer size above 1024 samples. A number of the UAD1 plug–ins have still to be ported across to the new platform too: at the time of writing we're waiting for Precision Maximizer, De–Esser, Buss Compressor and Enhanced kHz; Roland RE201; SPL Transient Designer; and the VCA VU emulation of Dbx's 160 compressor. The UAD1's delay–compensation plug–ins (Delay Comp & Track Adv) aren't yet available either, although I don't suppose many users will miss this, given the delay–compensation facilities now built into most modern sequencers — with the exception, of course, of Pro Tools LE. For trademark reasons, the guitar amp modelling plug–in Nigel will not be available at all for UAD2, so Universal Audio are currently investigating new guitar–oriented effects possibilities to fill the gap in the product line. The interface of the control software offers two separate windows, either or both of which can be set to float on top of any other active applications. The first is a usage meter providing separate DSP and memory indicators for each of the UAD1 and/or UAD2 cards in your system; and the second, larger window provides a set of tabbed pages for examining the status of each card and configuring the various card options, as well as providing direct links to plug–in purchase and support pages on the Universal Audio web site. The other main GUI enhancement is a new menu bar below each plug–in, which provides preset selection, the 'Copy/Paste Settings' function, the Live Track switch (of which more in a moment), and a direct link to relevant PDF manual and web support pages. In addition, if you've not yet authorised a particular plug–in, you can directly enable that plug–in's 14–day free trial, which starts straight away and allows you to get a feel for which plug–ins you like the sound of before shelling out. One of the cornerstones of Universal Audio's brief for the the new card was that any session with UAD plug–ins should load regardless of which hardware was powering the plug–ins (assuming, of course, that there is enough DSP power and the relevant plug–ins are authorised). Given that the UAD1 and UAD2 work very differently, this wasn't by any means a trivial task, and the solution that UAD have come up with is a tabbed page in the UAD Control Panel software, where you can select for each plug–in you own whether it will load up on the UAD1 or the UAD2. Although this certainly makes project loading smoother, the down side is that you can't run a plug–in on both cards at the same time, so if you nominate, say, all your 1176s to run on an existing UAD1 and run out of horsepower, you can't simply pop a couple more instances onto a new UAD2 — you have to migrate all the UAD1 instances to UAD2. Even assuming that this kind of plug–in assignment migration works flawlessly (I didn't have access to a UAD1 in the review system to check it out in practice), I reckon most people would get pretty sick of switching plug–in card assignments to accommodate the differing plug–in demands of different projects, and would just use their UAD1 for specific plug–ins where the limitation of constraining their usage to the UAD1's capabilities would be negligible. So you might use it to provide a single 33609 for bus processing, or a handful of Dreamverbs and/or Realverbs as global mix send effects. Given the leap in processing power that the UAD2 represents, it's not surprising that the plug–in counts advertised on the Universal Audio site are pretty mind–boggling. With a single Quad card, for example, you can run 72 stereo Fairchild compressors, certainly more than any of us are likely to see in hardware form in our lifetimes! 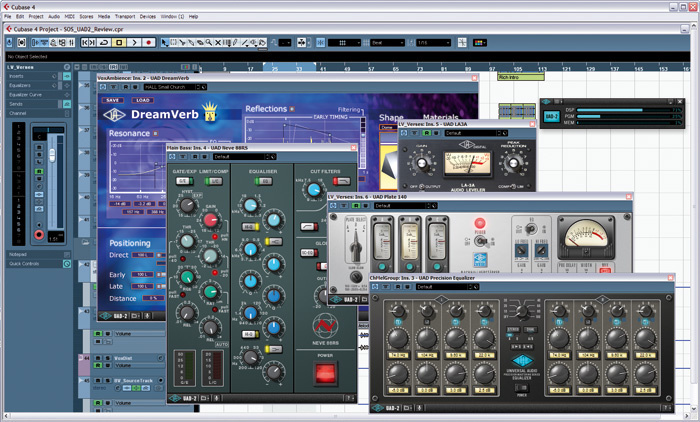 In terms of EQ, you can run 156 Cambridge EQs, 96 Pultec EQP1As, 80 1073s, or 64 1081s, while anyone addicted to Dreamverb could risk overdose with up to 28 simultaneous stereo instances. In addition, the new card also offers a special Live Track switch for each plug–in instance, which allows that plug–in to override the system latency and achieve a much lower processing delay for the purposes of live software monitoring. The down side is that your host CPU performance is effectively reduced for each plug–in in Live Track mode, although you don't have to switch all your UAD plug–in instances to Live Track to get the monitoring latency improvements, only those on the live–monitored track, in downstream buses, or in send–effect configurations. So How Many Plug–ins Can I Run? 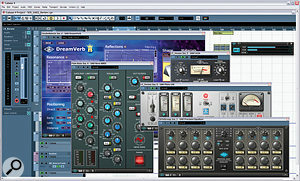 A selection of plug–ins running in Cubase — the hardware equivalents of this little lot alone would far surpass the price of the UAD2 Quad.Working with the latest version of Cubase, I found the Quad card did indeed deliver the plug–in counts Universal Audio have justifiably been bragging about, but only at higher latencies. For example, the much–trumpeted Nevana 128 setup (comprising the filter, EQ and compression blocks of 128 Neve 88RS plug–ins) was pushing Cubase's ASIO meter into the red and glitching even at a buffer size of 1024 samples, only running stably at 2048. At 512 samples I had to reduce the plug–in count to 80 to banish the glitches, while at 128 samples I had to bring it down to around 30 to keep the audio clean. Oddly enough, even when the Cubase ASIO meter was indicating a constant 100 percent load for 128 plug–ins at a buffer size of 256 samples, Windows Task Manager reported only 40 percent host processor usage, fairly evenly split between the four cores of my Phenom CPU, which makes me suspect that some transmission bottleneck is occurring between the card and the host PC. This feeling was strengthened when I tried maxing out the UAD2 with only 24 instances of the processor–heavy Neve 33609 plug–in, and found I could run comfortably at 512 samples latency, implying that there is a fixed processing/transmission penalty per plug–in instance. Searching a few forums turned up a number of other early users who seemed to be encountering similar problems in different sequencers such as Sonar and Logic, so I decided to contact Universal Audio directly for some input on this issue. Their response was to confirm my own experiences that host processor load is both proportional to plug–in count and inversely proportionate to buffer size, and also to say that the v5.0 software is not optimised for low–latency operation, suggesting that this might be improved in future software releases. Their recommendation was that users continue to operate with high buffer sizes for mixing work, to maximise plug–in counts. However, my fairly powerful quad–core PC was registering roughly 25 percent on the Cubase ASIO meter for a single UAD2 card running the Nevana 128 setup, even at the highest possible 4096–sample buffer size. If this kind of figure scales up proportionally for multi–card systems, then you may have to be running a fairly rocket–powered computer to access the full power of the new UAD2 platform without glitches, even if you only use powered plug–ins. Again, though, I wasn't able to test this in practice, with only a single review unit. Furthermore, the Live Track mode puts considerable extra strain on the CPU, thereby limiting your plug–in count further. For example, even at a buffer size of 4096 samples the Nevana 128 setup maxed out Cubase's ASIO meter the moment I switched even one of the plug–ins to Live Track, while the 3–4 percent ASIO–meter load of a single Neve 33609 plug–in at a buffer size of 128 samples jumped to around 18 percent when the plug–in was switched to Live Track. Certainly, Live Track does significantly improve monitoring latency in sensitive situations such as vocal overdubbing, where it justifies the extra processing load, but even without it the UAD2 latency seemed small enough to me that I reckon a lot of recording musicians will simply work without Live Track most of the time. As we were going to press, v5.1 of the UAD control software was released, and while this seemed to give slightly improved host CPU performance in Live Track mode, I otherwise noticed little difference in terms of plug-in counts at low latencies. All that said, it's worth pointing out that some users are reported to be running high plug–in counts at lower latencies without problems, so I am hopeful that driver tweaks from Universal Audio and/or the sequencer manufacturers may improve the situation. However, the flip side of this uncertainty is that purchasers can't really know what kind of low–latency performance to expect on their system without installing the card and putting it through its paces, by which time they've already parted with their cash. Also, to be fair, when Paul White looked at UAD2's main competitors, TC's Powercore series, he also experienced reduced plug–in count at low latencies, so expecting Universal Audio's card to deliver the full published counts at low latencies is rather akin to looking for a free lunch. Despite some of my concerns with latency and CPU drain above, this in no way detracts from the fact that the UAD2 is an enormous leap forward from the UAD1, and existing users happy with the latency limitations of the earlier card are entitled to froth with anticipation at the prospect of so much more of the same. There is also no doubt that Universal Audio are a force to be reckoned with in terms of the quality of their audio processing, and the more powerful card will doubtless entice many new users to dip a toe into the water. I have considerable confidence, given their previous record with software updates, that the company will throw their weight into dealing with the early driver issues and plug–in omissions as soon as they can, but only time will tell how far the UAD2's low–latency performance and host CPU drain can be improved. UAD Meter & Control Panel software v5.1. Line 6 Toneport KB37 audio interface. Rain Recording Solstice O3 PC with AMD Phenom 9750 quad–core 2.4GHz processor, 4GB DDR2 RAM, and Windows XP Pro with Service Pack 3. There are now more external DSP processing alternatives for computer musicians than when the UAD1 burst onto the scene in 2001, and probably the most direct competitors come from TC Electronic in the form of the TC Powercore series. I imagine that the choice between the two platforms will usually be made on the basis of the supported plug–ins, so you have to decide whether names like Sonnox, Tubetech, and Noveltech are more tempting than those on Universal Audio's roster. Powercore also already offers virtual instruments, including the Access Virus and Novation's V–Station. Some users may also prefer the option of Firewire interfacing in order to keep PCIe slots free for other purposes. Other systems worth considering if you're not as fussed about third–party developer support are SSL's various Duende systems, Waves' APA 32 and APA 44M, and Focusrite's Liquid Mix and Liquid Mix 16, all of which give you lots of extra high–quality processing via external DSP. Alongside the launch of the UAD2, Universal Audio have also announced a selection of new development partners. I was particularly pleased to see that Empirical Labs are now on board, with their first product apparently destined to be a recreation of their Fatso saturation unit. (If only Universal Audio can also persuade them to add their Distressor to the line–up, I'll be in heaven!) The Little Labs splendid IBP analogue phase–rotator and the EQ from the celebrated Harrison 4032C recording console are also in the works, and it appears that the Valley People marque is on the verge of resurrection too, with plug–in versions of their EQs, compressors, and gates planned by new brand–owners PMI. Most intriguing, though, is the connection that has been established with Moog, and the announcement of the company's multi–mode filter plug–in. Of course, this plug–in will be of considerable interest in its own right, but with Universal Audio heavily hinting at new developments, such as IR–based processors and virtual instruments, it doesn't seem entirely implausible that a virtual Voyager might shortly see the light of day. Keep an eye on those News pages, folks! I've always relied on my UAD1 card for certain high–end or specialist plug–ins but it can only run a very limited number of some of the more processor–intensive emulations, so the launch of the UAD2 gave me the push I needed to upgrade to a new quad–core Mac Pro. UAD kit has always installed easily, and the UAD2 Quad card was no exception. A single authoriser file can be downloaded from your UA account page and always reflects the plug–ins that you have purchased and registered with them, so moving to a new machine is the job of a few minutes rather than several hours. If you open a song that used the UAD1 equivalent of a plug–in, the UAD2 opens it quite happily, with none of that 'plug–in not found' nonsense. The speed claim of running 10 times more plug–ins than you can on a UAD1 card is approximately correct — sometimes it is a bit more, sometimes a bit less, but the extra power is really worthwhile and saves you having to compromise by using 'lite' versions of plug–ins that tend to use up loads of processing power. Now you can build a Neve console from channel–strip plug–ins, with more channels than the hardware guys could ever afford! The new Live Track low–latency mode is also extremely welcome for overdubbing, as any DSP–hosted plug–ins increase the system latency. This works by dispensing with buffering, which on my system hikes up the CPU load but reduces the latency to what you might expect when working with an efficient native plug–in in most cases. The only frustration for me, and one that should be eased by the end of the year, is that the last handful of plug–ins to be launched for the UAD1 card are not yet ready to be released in UAD2 format. Also, as my UAD1 card is designed for the old PCI slot format, I can't use it alongside the UAD2 in my new Mac in the interim. My final observation, though, is that when you consider the cost of the UAD2 card bundles, they offer extremely good value when compared with native plug–in bundles. Each of the new cards is available in three versions, making up three product ranges. All cards ship with the Mix Essentials II plug–ins as standard (1176SE, Pultec EQP1A, CS1 and Realverb Pro) and a voucher you can use to buy plug–ins, the value of which varies: $50 for the Base range cards, $100 for the Nevana range, and $500 for the Flexi range. The Nevana options add to this various extra Neve plug–ins: the Neve 88RS plug–in for Solo cards, and all the Neve plug–ins for Duo and Quad cards. As mentioned in the main article, there are further promotions for early adopters, both first–time buyers and those crossgrading from the UAD1. The system prices (including VAT) are given below, and at the current exchange rate of $1.80 to the pound there seems to me to be only about £20 advantage in going for any of the Flexi bundles over their Base equivalents. The Nevana 32 and 128 bundles don't fare much better, and the Nevana 64 seems to actually work out more expensive for UK customers than combining a Quad Base system with the Neve Classic Console MkII Bundle at $800 (roughly £435). Whether the retail prices on the street (or indeed future exchange–rate fluctuations) will make any more sense of this pricing structure I don't know, but as it is the multiple bundles seem a bit complicated, given what appear to be fairly small real–world price differences. UAD2 Nevana 32 (Solo card): £559. UAD2 Nevana 64 (Duo card): £1199. UAD2 Nevana 128 (Quad card): £1599. Although there are only three new cards, each of these is available in three versions, making up three product ranges. All cards ship with the Mix Essentials II plug–in bundle as standard (1176SE, Pultec EQP1A, CS1, and Realverb Pro) and a voucher which you can use to buy plug–ins, the value of which varies: $50 for the Base range cards, $100 for the Nevana range, and $500 for the Flexi range. The Nevana options add to this various extra Neve plug–ins: the Neve 88RS plug–in for Solo cards, and all the Neve plug–ins for Duo and Quad cards. As mentioned in the main article, there are further promotions for early adopters, both first–time buyers and those cross–grading from the UAD1. UAD2 Nevana 32 (Solo card): $899. UAD2 Nevana 64 (Duo card): $1899. UAD2 Nevana 128 (Quad card): $2499. Dramatically increases the maximum processing power of the UAD platform. Four UAD1 and four UAD2 cards can be run on a single computer. Gives access to some of the best–sounding analogue emulation plug–ins available. Live Track reduced–latency mode significantly improves the software–monitoring experience for overdubbing purposes, albeit at the expense of higher host CPU drain. Good–quality bundled Mix Essential plug–ins. Improved control software, with simple plug–in DSP assignment and authorisation facilities. Low–latency operation on the review system reduced plug–in counts considerably. Significant host CPU drain even at large ASIO buffer sizes. Where both card types are in use simultaneously, you can't run the same plug–in on both platforms. RTAS format isn't yet supported. Some plug–ins have yet to be ported over from UAD1, and the Nigel guitar effects plug–in won't be making the transition at all. Up to 10 times more powerful than the UAD1, and offering access to a collection of the most sought–after analogue emulation plug–ins, the new UAD2 is certainly a mouth–watering prospect. For the moment, though, you'd be best advised to use a powerful computer at high buffer sizes if you're to access the maximum plug–in counts. See the 'Options & Pricing' box.